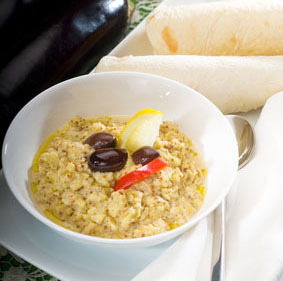 Also known as Baba Ghanouj. This is a lovely recipe made at our detox retreat in Spain by Fi. It has a fantastic smoky flavour and makes an excellent accompaniment for tortilla’s or raw vegetables. A real authentic recipe full of Eastern promise! Burn your aubergines first! Use a cake cooling rack to help position aubergines directly over a gas flame, whole. Turn them so they singe fairly evenly and the flesh inside starts to cook in its own heat. Do this to all the aubergines. Don’t worry if inside is not evenly cooked, the blending will sort this. Remove the blacked skin with a knife. Serve with coriander or parsley and a wedge of lemon. I love the smokiness of this dip, absolutely delicious!